is everything users on the go could ask for and more because it has a long-lasting battery and quick charging features. It has a 4000mAh battery which gives a talk time of 17 hours. A 15 minute charge will give up to 4 hours talk time. 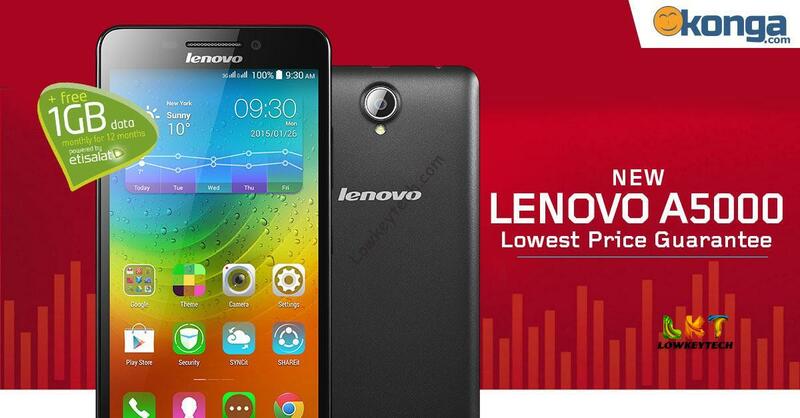 The Lenovo A5000 has an 8 megapixel rear camera and 2 megapixel front camera which captures moments as pictures. Thanks to its screen size, users can accommodate even more friends in their selfies. The A5000 also comes with a splash proof screen that protects the device from getting damaged by water splashes or other liquids. With 8 GB of internal storage, users can save their favourite multimedia files and other important files. The storage is expandable by as much as 32 GB with a micro SD card. This A5000 comes in black and white. Get the A5000 for just N27, 000 exclusively on Konga.com, click here to order. Free shipping also applies to your location in Nigeria.